Bradley Park Golf Course is open for business as usual and KAL are not expecting any material changes to the course for at least the next 2 years. Attached is the Green’s report for February. The Club held it’s annual Burns Night celebrations at the Holiday Inn, Brighouse on Saturday 26th January 2019. There was a great turn out of 133 enjoying the evenin. After the usual opening sing song, Mr Captain did his Ode to the Haggis. Everyone seemed to enjoy the meal cooked by the new chef. The mega raffle went down well with some brilliant prizes on offer, probably the best yet. Psychoslinkys got the room rocking and the dance floor was full all night. A big thank you to all the people who helped to make the evening a success. Bookings are already being taken for 2020. Attached are posters with details of Mr Captain’s and Mr Rabbit Captain’s Away Day. Please support your Captains in this fantastic golf day. 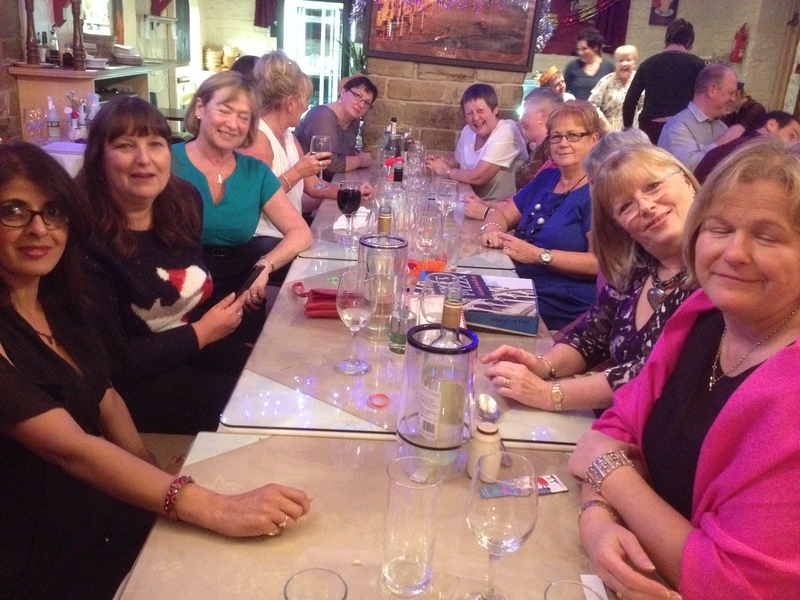 Seventeen ladies went for their annual Christmas meal on Friday 7th December to Pregos in Brighouse this year which was organised by our Lady Captain, Annette Bird. We enjoyed as mix of festive and Italian food, one or two drinks and lovely company. The evening ended with Secret Santa putting us all in the mood for Christmas. Any queries please contact Gary Ward. With effect from the Annual General Meeting (AGM) in March 2019 there will be a vacancy for the role of Competiton Secretary. As the Competition Secretary is an Officer of the Club anyone who is interested in taking on the role must have been a Club member for at least 3 years. You must be nominated by 2 Club members who have been Club members for at least 12 months. The Competition Secretary is elected by the members present, entitled to vote, and voting, at the AGM. The Competition Secretary holds this role for a 3 year term. However, because of the work involved at this time of year (Fixture list/Handbook) it is important that the Committee begins to find a replacement as soon as possible. Sincere thanks must go to the current Competition Secretary , Michael Waddington, for all his hard work over a number of years. If you are interested in this post, please contact me before the 18th November, prior to our next Committee meeting. I can be contacted by telephone – Home 01484 917180, mobile 07908862621 or email – Sandra.roecliffe@hotmail.co.uk. The ladies had an excellent evening of food, entertainment and company on Friday night. 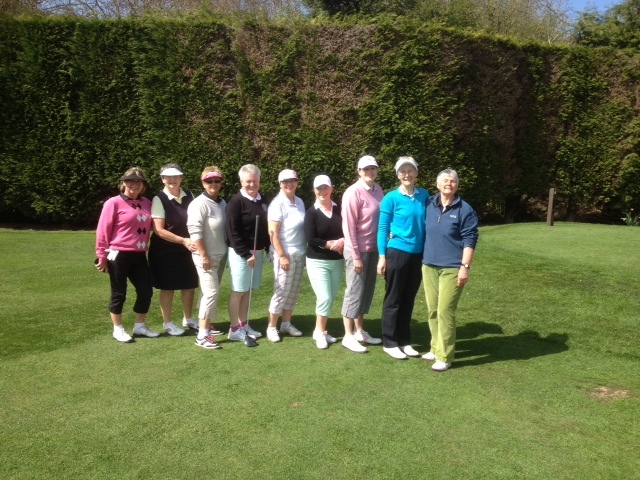 Lady Captain, Annette Bird was joined by her fellow Captains and around 40 members and friends from the club. Her guest speaker was our past Captain and Past President Derek Broadbent who spoke with interest, passion and emotion about his wonderful musical career. Derek was then ‘entertained’ by our rendition of the ‘Floral Dance’. Linda Bemrose – Jackson cup, Nett eclectic Silver Salver and the Ronald Shillito Gross eclectic (double winner for the 2nd season). Lucie Hallas – Championship and Jubilee Cups, Committee cup, Accumulated under 60s 18 hole Stablefords, Golfer of the Year. Sheila Harrison – 24 and over cup. Pam Flaherty – Accumulated over 60s 18 hole Stableford, Ladies Matchplay knockout. 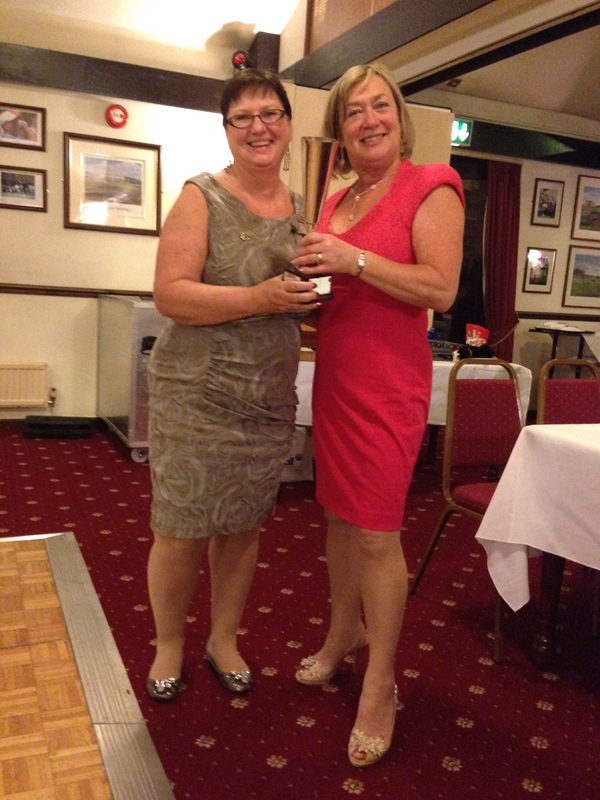 Sheila Braithwaite and Sarah Pickett – Ladies Pairs knockout. An evening of awards and firsts for our Junior section saw trophies presented and triumphs reviewed at a packed clubhouse last Friday. For Kayla Lewis and Matthew Pickett it was a first season at Bradley Park. By the end of the year both had made first appearances in Huddersfield Halifax Union Order of Merit events. Matthew won his first prize, runner up in the Dewsbury 9 hole challenge. Vinnie Washington won his first President’s Trophy as well as a string of Skills Challenges and made the shot of the year. It takes a good deal of skill to bounce a golf ball across the pond at the second and finish on the green! Junior Captain Gabriella Child won her first Ladies major, helped the Ladies thrash the Rabbits in the annual fixture in May and made her first gross ‘two’ during the summer. Kayla Lewis didn’t have to wait as long for her first real birdie, making a two in only her second ever stroke play round at Bradley! Michael Edwards made his first ‘eagle’ at the par 5 fourteenth at Saddleworth in August, won two Rabbit stableford competitions and finished the year playing off a 14 handicap. He’s in his first term of a BTEC Sports course with golf as his specialist subject – we’re expecting a single figure handicap next year. Connor Crossley, who turns 18 this December, leaves the section having won his first Membership medal and after four years of resolute performances in league, knockout and Order of Merit golf. He was the first recipient of the new Special Achievement Shield – awarded in recognition of his fighting spirit in league golf in 2018. Tom Wild presented his trophy to Kayla Lewis for her hard work in coaching sessions with Joe Lester. Matthew Pickett won the Nicholson Trophy for the best 28+ handicap golfer. The Bob Kemp Trophy, for winning the Order of Merit went to Michael Edwards. Golfer of the Year, decided after long debate, went to Gabriella Child in recognition of her wins in the Ladies Rose Bowl, performances in Rabbits vs Ladies and the Pro-Captains’ Challenge. In her closing speech Gabriella thanked Tom and Joe for the fabulous support that the pro-shop team have given us over the year – on course, on the range and for their generous sponsorship of the club Junior Open Day. Joe’s coaching has had a huge positive impact on every junior’s game this year. She also introduced Michael Edwards as the Junior Captain for 2019 – he’ll have a tough act to follow. We have a brilliant set of juniors, who garner praise about their ability and attitude wherever they play. They are supported by an enthusiastic group of adults, parents and relatives. Special thanks go to Linda Bemrose for her work with the League team, and to our President Sandra Shillito, Derek Broadbent and to everyone who has helped with on course sessions, sponsorship or transport. We’ve had a summer to remember and 2019 isn’t that far away. If you know anyone with youngsters of any age interested in taking up golf contact Cliff Froggett – we’re already recruiting for next season! Here is the September Greens report. Any queries please contact Gary Ward. Please find the results of our Seniors Open held on Tuesday the 11th September . Thank you to all that took part in the event and supported Bradley Park. Well done to all winners. It is that time of year again when the Winter Social golf begins on Fridays. This is open to all sections of the club. For more details and dates see the attached poster. Lady Captain, Annette Bird and Lady President, Sandra Shillito along with Sandra’s grandson, Vinnie took part in the Midnight Memory Walk to raise money for Kirkwood Hospice raising around £850. Both our Club Captains are supporting Kirkwood this year and would like to thank members, family and friends for their continued support. Attached is the Greens report for August. Any queries, please contact Gary Ward. 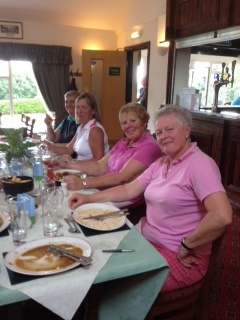 On Wednesday 25th July, Lady Captain, Annette Bird, held her Away Day at Shipley Golf Club. It was a glorious day which started with some serious clothes shopping when we arrived followed by bacon sandwiches and coffee to fuel us for the game ahead. Nineteen ladies supported Annette who had organised everything, from our teams to a fantastic halfway where she had provided a much needed glass of Bucks Fizz, homemade cakes, quiches and other nibbles. Annette presented the winners (Sandra, Sarah, Diana and Sue) with lovely baskets of golfing goodies following a 2 course meal of chicken and strawberries. All in all it was an excellent day. A huge thank you to Annette from all the Ladies. A) The overall Kirklees Local Housing Plan has NOT YET been approved. B) Bradley Park has NOT YET definitely been included in the Plan. C) Even if Bradley Park were to be included in the final approved Plan, there are still a number of hurdles to be cleared before part of the Course would be closed. The day took place yesterday with members playing golf in very mixed weather, from sunshine to thunder to high winds. Richard, as always organised a fantastic day culminating in the prize presentation at night. The room was packed with members, family and friends supporting Richard and they enjoyed hot beef sandwiches and chips and were entertained by the band, Park Life. Simon Day won the loud shirt competition for the second consecutive year even though virtually every member wore highly patterned shirts and tops. The overall winners from the golf were presented with their trophies by Richard. Well done to our Lady President, Sandra Shillito and to Ricky Hemingway. Thank you Richard for his time and hard work organising a superb day and night. Attached is the Greens report. Any queries, please see Gary Ward. I just wanted to say a big thank you for your tremendous support last weekend and I hope you enjoyed the weekend as much as I did. For those of you who don’t know, my nominated charity for 2018 is Kirkwood Hospice and over the weekend we managed to raise £1650.00 which is a fantastic amount of money. Well done and once again a big thank you. AS OUR SEASON IS NOW IN FULL SWING HERE ARE THE CURRENT QUALIFIERS FOR THE TOURNAMENT OF CHAMPIONS TO BE HELD LATER IN THE YEAR–HAPPPY GOLFING! ENTER AS MANY COMPETITIONS AS POSSIBLE AND YOU TOO CAN QUALIFY FOR THIS EVENT BY BEING AN OUTRIGHT WINNER. 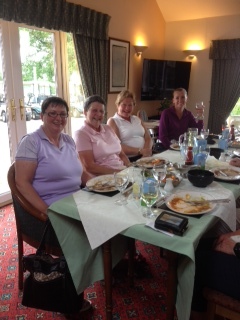 Four of our lady members, Annette Bird, Sue Malins, Pam Flaherty and Jean Longbottom played in a Texas Scramble at Outlane GC on 14th June. It was an unbelievably windy day and Outlane being where it is meant that conditions were extremely difficult. Good drives were turned into very average ones and club selection was a bit of a lottery. The combined handicap of our team was 87 and we played off 10%, 8.7. The team combined well and managed to par or birdie a number of holes. Our final score was 66.3 and this proved it be the winning score. The ladies enjoyed a very social supper after and received M & S vouchers at the presentation. This takes place on Saturday 28th July and as always will be a fun packed day and night. Please support Richard on this day by playing in a team and by attending at night when you can bring along family and friends. Mr Captain’s weekend begins on Saturday 14th July with Captain’s Day Medal Competition. There are plenty of prizes on offer for the day and there will be a BBQ and drinks to keep us going after the 10th. Entertainment follows in the evening where we will be entertained by the fantastic band, Psychoslinkys after the prize presentation, along with a supper. Please come along and bring family and friends to support Mr Captain. The day after, Mr Captain has organised a Team Am Am Am Am. Anyone can enter this, members and non members and teams can be mixed. Mr Captain invites everyone to join him for a drink after and to watch the World Cup final. Please click on the link to see more information. The raffle raised £61 and the winner is Stuart Eakin. Thank you to all who supported this. Thank you to everyone who took part – having played the course today I can understand why so many were singing the praises of the course – a big hats off to the green keeping team. Thanks also to the team that set up the gazebo and everyone who donated prizes or food. If you didn’t get any of Annette’s bakewell tarts it’s too late now – I’ve got the last one with a cup of tea. Make sure you are there for her Lady Captain’s day on Saturday 18th August when I’m sure there’ll be a grand selection at the halfway house. Prizes will be presented at the evening event on 18th August. 2nd – Joe Akhtar , 6th – Stephen Midgley, 13th – Harry Belafonte, 17th – Barry Martin. £25 will be paid into your pro-shop account within the next 10 days. Joel Marsh, Paul Kaye, Karl Schnacke,Martin Anderson. £30 will be paid into you pro-shop account in the next 10 days. £50 prize – Sheila Braithwaite, £25 prize – Roger Pearson. Low Laithes Golf Club – Ben Page. To see today’s winners and photos, please go to the Events page and Ladies Open. Below is the Greens report for June. Any queries, please contact Gary Ward. The 2017 Captain, Mr Phil Smith, had the pleasure of presenting a cheque to the Forget Me Not Community Fund raiser, Shamaine Armstrong. Bradley Park held numerous events throughout the year and great support came from the members. £2090 was the total raised and the Forget Me Not were very happy with the donation. This will help with the fantastic work they do for families throughout the district. The Ladies took on the Rabbits in glorious sunshine on Saturday 19th May. 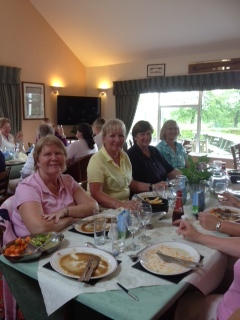 After a fun day with plenty of great golf followed by a cream tea, the ladies conquered the rabbits 5.5 to 2.5. 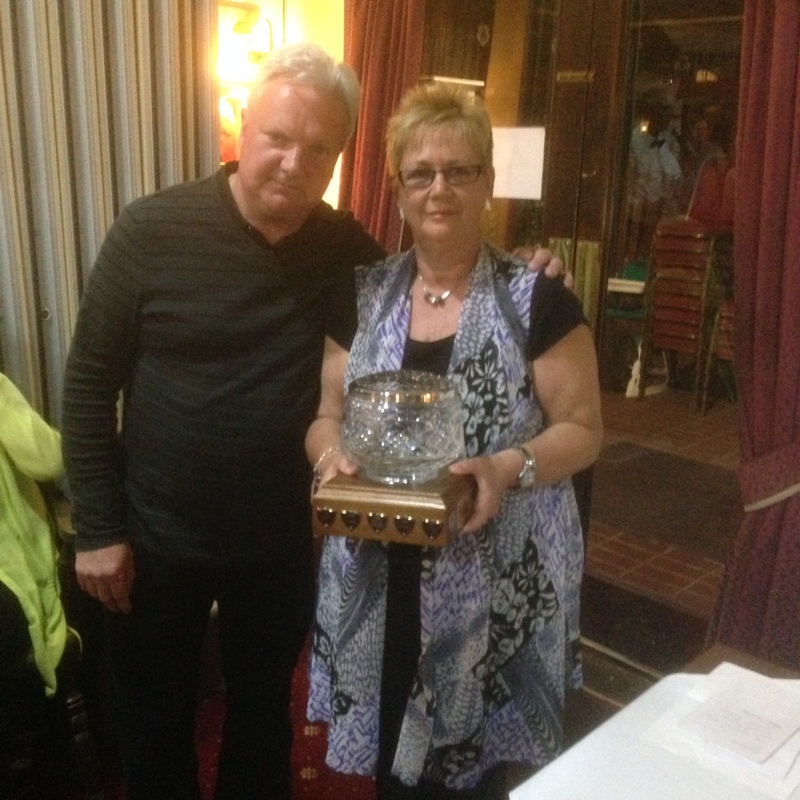 The Rabbit Captain, Mr Cliff Froggett presented the trophy to the Lady Captain Annette Bird. Well done ladies! Attached is the Greens report for April. Any queries, please contact Gary Ward. Congratulations and well done to the winning team in the Texas Scramble. A great turnout and this brings the total raised for the Forget-Me Not Charity to £1910.39 in my term as Captain. To everyone who has contributed, may I thank you for helping me raise this amount. Thank you and well done. I will present a cheque in the coming week or so to the charity on our behalf. I am hoping that the weather allows the above competition to go ahead. The format is a 4 person team with 2 to count on each hole and all 4 to count on the par 3’s. £5.00 entry per person with all the proceeds going to Kirkwood Hospice. A competition desk will be manned to take your entry fees and 4am scorecards will be available. In addition I would advise that complimentary coffee and bacon butties will be available in the club house from 8 a.m. There is also a competition to guess the combined driving distance of Tom Wilde and myself on the first hole. We will be teeing off at 9.34 and it costs £1.00 per guess (guess as many times as you like) with 50% of the proceeds going to the winning guess and 50% to my charity. Weather permitting I look forward to seeing you all on Sunday. We raised £275 for Phil Smith’s Charity – The Forget Me Not charity. The winners with a total of 54 were Karl Schnacke, John Flaherty, Tony McCullagh and Paul Folan. Congratulations to them. Attached is the Greens report for March. Any queries, please contact Gary Ward. The club charity Christmas Texas Scramble which was postponed in December has been re- arranged to Sunday 1st April. Please can we support the Forget Me Not trust and blow away our winter blues at the same time. It is a chance to put together some great teams both from a social point and also a competitive one as was shown at Christmas before it was cancelled. The amount raised for charity here could put the total up to £1800. Enjoy and good luck to you all. A great night was had at the annual Burns Night Dinner at the Holiday Inn Brighouse with 111 members, friends and guests enjoying a traditional Burn’s Night supper. The evening was kicked off with Nathan (Scottish Piper) followed by Mr Captain who sang ‘500 Miles’ and also did the Ode to the Haggis. Following the meal, Psychoslinkys played two spots and the dance floor was full all night. Thankyou to all who supported the evening. Every year seems to get better and better. Already taking table bookings for 2019. 2. From Jan 2018 there are two new handicap categories for men Cat 5 is 29 to 36 and Cat 6 is 37 to 54. Upward adjustments will remain at 0.1 and downward adjustments will be 0.5 for Cat 5 and 0.6 for Cat 6. 3. Handicap increases above the previous 28 limit will be automatic. 4. The “c” annotation for Competition Handicaps applies to all six catagories. 5. Players receiving Initial Handicap Allocations are also allocated a “c” status. Williams, Mounie, Lolley, Schindler, Palmer, Malone, Smith, Whitehead, Payne, Coleman, Green, Hadergonaj, Quaner, Kachunga. Any funds raised will go to the Captain’s Charity (The Forget Me Not Children’s Hospice). The highest bidder will be announced at the start of the golf season. Thanks in anticipation of you support. There is an update from committee on the Home page of the website along with a link to contribute to help support the fight against Kirklees Council and their plans to build 1500+ homes on Bradley Park. The Family Christmas Dinner was held in the clubhouse on Saturday 16th December 2017. Festive fun was had by all, plenty turned out in bright Christmas hats & clothing. Well done to Tom McGarrell who wore a brilliant Christmas shirt. Everyone joined in and enjoyed the family games. The present game saw people moving all over the clubhouse hunting down new gifts for their table. Everyone sang the 12 days of Christmas (twice) with people in great voice. Thanks to all who attended & supported the night although it’s a shame we didn’t have many club members in attendance. You missed a fun packed evening. Why not take a break from Christmas shopping and put a 4 person team in the Texas Charity Christmas Scramble on Sunday 17th December? Ladies get 5 courtesy shots, one tenth handicap and non members can play so you can bring along a guest. The cost is £5 per person for a good cause. Hope the weather is kind. We look forward to seeing you on the course and in the club house afterwards. Attached is the Green’s report for November. Please contact Gary Ward with any queries. The Club Presentation evening took place in early November with many club members receiving prizes and trophies after speeches from various team Captains and before an excellent raffle and disco. Here are the winners of the Club Championship and Harrison Cup. A very well attended Ladies dinner took place in October to celebrate the achievements of some of our golfers through the season. Sandra Shillito was our Lady Captain’s guest speaker and she entertained us with tales of her driving days. We had the pleasure of inviting the Captains from other clubs who told our Lady Captain that they thoroughly enjoyed their evening and the welcome that Bradley Park gave them. Here are some photos of our winners receiving their trophies from Carlyn and one of Linda Bemrose displaying her trophies as Golfer of the Year for a well deserved second year running. The whole family is invited to the Race Night on Saturday 18th November. We hope you’ll come along and enjoy a fun evening with plenty of excitement as our guest commentators whip proceedings into a frenzy and our junior jockeys battle it out for a mountain of chocolate! Cliff will be selling horses at Presentation Night even if you can’t make it on 18th have a fiver ready – you could win a prize. Bring the kids, grandkids, friends, neighbours – there’s no admission cost – and have a fun evening. The Club Presentation Evening takes place next Saturday, 11th November. All prize winners from the year will be awarded. Please refer to the email from Michael Waddington to see if you are on the list of prize winners. If you are unable to attend please contact Michael in advance. All members, family and friends are invited to support and celebrate the achievements of the winners. There will be food, a luxury raffle and disco on the night. Woolley is a deceivingly tricky course and the ladies had an additional weather sandwich to further impede them consisting of layers of heavy showers and warm sunshine with a side of rainbows! Everyone had a great time and the day was completed with a full old fashioned English Afternoon Tea of homemade goodies accompanied by a couple of glasses of Italian prosecco! The winners on the day were Mary Workman, Lisa Driver and Linda Bemrose. Great news! Thanks to your support we have so far generated £1073 for the Forget Me Not Children’s Charity during my term . Thanks to all who donated a pound on the Membership Medal competition day which along with the proceeds from the Charity box from the bar this generated £145.22. This is a great local cause and your support continues to be fantastic . Please bring along friends. We look forward to seeing you all there. Seems like only yesterday we were putting away the galoshes and winter woollies but now the nights are drawing in and the shorts are back in the loft for another year. The good news is that we’re starting the Winter Social early – first competition will be this Friday 30th September. The format remains the same, meet for coffee from 11 onward and play 10 holes from 12. Pete has done a splendid poster that’s attached to this with all the details. We look forward to seeing you this week and throughout the autumn and winter. Please see the attached. Any queries, please contact Gary Ward. In the HHDRGA League, Bradley Park had some tough fixtures to play in 2017. All our opponents were 9 hole golf courses with a lot of travelling involved. Unfortunately we have been relegated to the lower division D.
We need more club Rabbit members to take part in this competition. I would like to say thank you to all the Rabbits that entered into the League matches: Paul Kinghorn, Ben Page, Trevor James, Peter Higham, Richard Rodgers, Club Captain Philip Smith, Rabbit Captain Robert Balcam, Melvyn Bathgate, Alain Riley and David Singleton. In 2018 Bradley Park will be playing against the following clubs: Elland GC, Ryburn GC, Saddleworth GC and Halifax Ogden GC. Unfortunately, due to a waterlogged course, the Seniors Open on Tuesday was postponed. The event will now take place on Tuesday 26th September. Details are the same and there are still places available. Please contact Keith Waddington to confirm tee times. We look forward to seeing all members, family and friends at the Casino Night on Saturday 23rd September. Come and take your chances on the roulette table, at blackjack and craps. This is an excellent, fun evening for everyone. Tickets are on sale behind the bar for £5. Please see following for more information. Please see the attached. Any queries contact Gary Ward. See the oster below for information of what will be a fun social evening for members, family and friends. Please support your Rabbit Captain (Bob Balcam) and Lady Captain (Carlyn Wiltshire) for what will be an excellent, entertainment packed evening. Please see the attached for the Greens report. Any queries or suggestions, please contact Gary Ward. After getting off to a wet start the 13 teams enjoyed some great golf and weather as the day went along. Plenty of prizes on offer kept everyone interested all the way round. HP Plumbing Services – Circle Golf – Holiday Inn (Brighouse) – Tom Wild – Del Sol Heating Engineers – Portal Financial Planning Ltd. The clubhouse was full in the evening with people wearing very bright loud shirts. Some brilliant shirts made it difficult to choose a winner. In the end the winning shirt was awarded to Simon Day who had a white shirt with streaks of paint on it. The band Bootylicious made their first appearance at the club and they worked hard to keep people entertained all evening. Men’s champion Paul Stringer 43 points and Ladies Champion Carlyn Wiltshire (Lady Capt.) 39 points. A huge thank you goes to Richard Kaye for organising this superb day! Twenty-seven players entered this gruelling 36 holes competition. The morning round produced some excellent scoring led by Ben Kaye who shot a fabulous 69 for 64 nett, followed by Phil Fullwood with a 72 for 67 including a little mishap on the 17th- otherwise he would have been a lot closer. In a group at third place sat our Captain Phil Smith with 69 nett. Going into the afternoon some of us were playing for pride but some still fancied catching our leaders. The afternoon produced some explosive golf led by Graham Hollingdrake who shot a 70 for 63 and Adam Taylor who shot a 71 for 65. These scores produced a nail biting finish but our first round leader Ben Kaye with a 74 for 69 managed to prevail by one shot. Congratulations to Ben on his third Harrison Cup win. It is the match we wait for with anticipation every year… and definitely my favourite!Why? Because it is not only a strongly fought competition where the reputation of either side is at stake, but also a great fun day out with loads of banter no matter who wins. It was evenly matched this year with no shot advantage for the ladies and a distance equaliser of the rabbits driving off the white tees. We started bantering over bacon butties and it continued until the last scone was buttered & jammed…. In between the eating & bantering some really good golf was played. The final score was 4-2 to the lady golfers. What a nail biter this year has been! I was privileged to be a part of such a great effort from the ladies. Well done to the Rabbits for fighting hard… well done the ladies for some amazing golf!! Thank you to all who attended and supported my Captain’s day. At the hut, £211.41 was donated for my charity, the Forget – Me -Not trust and £47.41 was donated through the Captain’s bunker. I hope everyone enjoyed their day as I did. Eighty-three players took part and the men’s winner was Bradley Haywood with 68 and the ladies winner was Sheila Harrison with 36 points. The division one winner was D. Moville with 70, division two, R Subham with 70 and division three H. Dews with 69. We had nearest the pin winners and fun prizes for golf hats extraordinaire. Thanks to DCS Dust Extraction Services, Premier Coaching and Acorn Asbestos Solutions for their sponsorship. Once again thank you to all who helped make this a very enjoyable day and evening. Any queries, please contact Gary Ward. After a wet few days, the weather for Open Day turned out to be bright and sunny. The golf was therefore enjoyed by all. Congratulations to all the winners and many thanks to everyone who played today for their support of our Ladies Open Day. 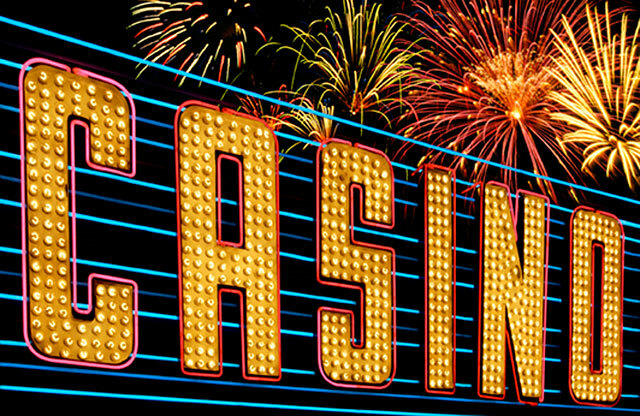 Please note that due to various reasons the date of the Casino Night has been changed to Saturday 23rd September. Please keep a look out for further details about this evening on the website and in the club house. Please see the attached for the Greens report. Any queries, contact Gary Ward. The Bradley Park Away Day was held on 26th April 2017 at Hillsborough Golf Club, just outside Sheffield. The course is set quite high in the hills and the weather was cool and breezy – with a little of the “all four seasons” element to it. A total of 32 members attended split roughly equally between the three categories of the competition, namely Tigers, Rabbits and Seniors. The general consensus was that the course was tight, but fair and the greens were good considering the time of the year. The scores for the prize money places were extremely close with count-back required to identify the Overall Winner and also to determine the Leading Tiger. The Overall Winner, who collected the Trophy and winners purse was Paul Stringer (37 points) who pipped the “bookies favourite” Alan Brown (37 points), who took the purse for the Leading Senior. The Leading Tiger was Graham Hollingdrake (36 points) and the Leading Rabbit was Melvyn Bathgate (35 points). Ken Harrop demonstrated that devotion to practice pays off by collecting both nearest the pin prizes – one being only 9 inches ( in old money) away from the pin! The winner of the “nearest the pin in 3 shots” prize on the “short” ( near 600 yards 18th) was Steve Barraclough. The tote feature again proved popular and the spoils for first and second past the post were shared six ways. Thanks to all who played and those who contributed in any small way to the organisation of the day. The club house was packed with a sell out audience for the ABBA Mama Mia Murder Mystery night last Saturday. An enjoyable night was had by all as can be seen from the photos. We were entertained by the actors from Laughlines, whilst tucking into our 2 course meal. A disco with classic tunes ended the evening with many taking to the dance floor. Mr Captain’s Day takes place on Saturday 20th May. Mr Captain has organised a day packed full of golf competitions, novelty competitions, including fancy, colourful hats and evening entertainment. Please come along and support Phil and his chosen charity. It would be great to see the club house full of members in the evening. Please click on the link below to see the poster. Please see below for the April Greens report. Any queries, please contact Gary Ward. 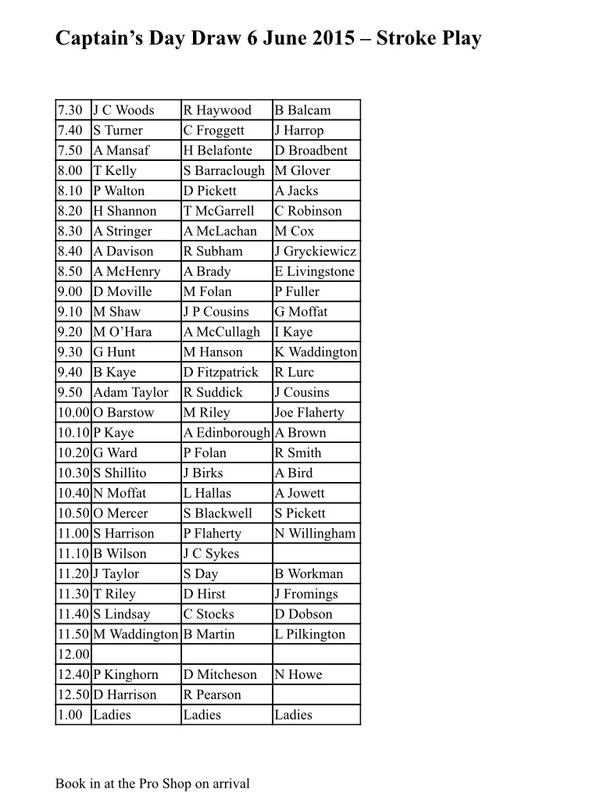 Club four ball better ball medal play was played on Sunday 16th April. 20 teams took part and there were a few outstanding scores with Tony Kelly & Paul Walton 3rd with 64. The top 2 finished on 63 and the result could not have been closer going down to a back 3 count back and the winners were Rodger Dandridge and Paul Stringer. Second place went to Steve Turner & Amsal Mansaf. Thank you to all teams that played. We were treated to glorious weather and the Club house was full of members and guests enjoying a coffee and sandwich. Our Captain Phil Smith teed off at 9.30 watched by a healthy crowd willing him and Tom Wild to hit it the distance they had bet on. The distance in the end of the combined drives was 442 yards- the winner was Trevor James. 21 teams took part in the event and the winners with a grand total of 94 points were Joe Lester, Josh Lester, Martin Shaw and Joel Marsh. The Pro/ Capt team consisting of our Captain Phil Smith, Pro Tom Wild, Sandra Shillito and Junior Captain Rhys Haywood scored a very creditable 89 points. This score in the end was bettered by 3 teams . Phil‘s chosen charity The Forget Me Not Trust will benefit to the tune of £500 from entrance fees, guess the drive and Phil’s donation. A big thank you to all who took part and made this a very successful day. Congratulations to all winners and thank you to all competing teams. Mr Captain has chosen the bunker on the right hand side of the green on the 3rd hole as his charity bunker. He asks that on entry into the bunker, please can members donate a voluntary 50p into the collection barrel which is placed on the bar in the clubhouse. The money raised over the season will go towards Mr Captain’s charity, the Forget Me Not trust. Please see the attached for details of this challenge and other events on the day. A reminder to all members that the closing date is 26th March, so if you want to play please sign up asap. Would all members please take note that the Club’s A.G.M. is to be held in the clubhouse on Thursday, 16th March 2017 commencing at 8.00 p.m. All members are very welcome and it is hoped that as many members as possible will come along to this meeting. now up in the locker room (New Members board). From January 1st 2017 England Golf require players to return all scores in competitive golf in Non-Qualifying Competitions away from the players home clubs, to assist handicap committees with handicap reviews. These scores will not directly affect a players handicap, but will be used as supporting evidence of performance when it comes to a handicap review. Individual scores or Team results must be returned in all Singles, Am-Am and 4BBB with the exception of Texas Scrambles, Foursomes and Greensome competitions or casual rounds. Date of competition, format (inc Handicap Allowance), Venue/Course, Tees used, SSS of course, names of playing partners (if a team/pairs event), score returned. Failure to return these scores by the player could result in the loss or suspension of handicap under clause 24.1. Any queries please contact Paul Kinghorn (Handicap Secretary). If any member would like to see the Golf Club committee meeting minutes any month, please contact the Club Secretary. Results for last week: 1st – John Gryckiewicz 24 points, 2nd – John Wood 23 points (count back), 3rd – Phil Smith 23 points. There was a total of 16 entries. Well done to Peter Higham for organizing the results. Thanks to all those who supported the Rabbit’s Race Night on Friday 10th February. It looks as if we will have raised around £150 for the section to support our competitions, friendlies, league and cup matches throughout the summer. Whether you were there on the night or supported us by purchasing a horse we appreciate your generosity. Club Champion – Danny Moville, Harrison Cup – Graham Hollingdrake, Webster Wilson – Ricky Hemmingway, JW Taylor Millenium Cup – Michael Waddington, Windle Cup – Mick Riley, Broadbent Davison – Andy Stringer and Phil Smith, End of Season Finale – Michael Waddington. Ladies Champion, Jubilee Cup and Golfer of the Year – Linda Bemrose, President’s Trophy – Sandra Shillito, Richard Kaye Social Cup – Lucie Hallas, Professional’s Prize – Carlyn Wiltshire, Mixed Greensomes – Sarah and David Pickett. The evening was rounded off with lovely hot beef sandwiches and chips and a raffle organised by the social committee which included some excellent prizes. Thank you to everyone who donated towards this. Well done to all prize winners and good luck to everyone for the next season. The Social Committee have organised an excellent ABBA Murder Mystery Night with the entertainment given by the national company, ‘Laughlines’. The evening, on Saturday 22nd April will include the entertainment and a meal. The time and cost tbc very shortly. Please keep an watch out here and in the club house where you will be able to sign up for the evening. Please bring along friends and family. Further information about the evening can be seen by clicking on the link below. All members, family, friends and jockeys under 4 feet tall are invited to the Rabbit’s Race Night on Friday 10th February. This is an excellent night of family fun . Entrance is free with a tote on all 7 races with the first race at 7:45pm. Food will be available at the bar. You will all have the opportunity to buy a horse at next Saturdays Club Presentation Evening. Please come along and support the Rabbits. to update you on the current situation. Framework to which the Council must adhere. date of the Inspector’s hearing as soon as we know it. A reminder to all that the re-arranged Presentation Evening takes place on Saturday 4th February with a new starting time of 7.30pm. If any prize winner is unable to attend, please can you inform Michael Waddington at least a week before to ensure there is no loss of prize. Congratulations to the winners Steve Turner, Amsel Mansaf, Trevor Riley and Eric Riley with 56.5. £241 was raised for charity. Well done all participants. The newly refurbished club house was packed to the rafters on Saturday 17th December for the annual Christmas Party attended by over 90 members, families and friends. The evening began with a vocal rendition of the ’12 Days of Christmas’ with some unusual actions taking place. This was followed by a 3 course carvery before Derek and Richard entertained with various events for children and adults and a seasonal quiz. The games were interspersed by a keenly participated raffle with a twist. Everyone was after the possible golf club package which turned out to be tins of sardines (ha ha!!) Everyone had an fun and entertaining evening. Thank you to Derek Broadbent and Richard Kaye for providing an excellent start to the Christmas festivities. Attached is the Green’s report for December. Any queries, please contact Gary Ward. 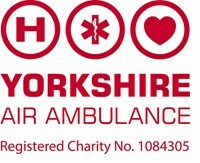 Throughout the year, Lady Captain, Sheila Braithwaite has organised events such as a Fashion Show and Lady Captain’s Day to raise money for her chosen charity, Yorkshire Air Ambulance. The photo below shows Sheila, Sandra and Tina presenting a cheque for a fantastic £900 to Angela Mahandru, the Community Fundraiser from Yorkshire Air Ambulance. The Club Presentation Evening will take place on Saturday 4th February 2017 with a new start time of 7:30pm. Please refer to page 31 of the club handbook for the procedures for this evening. First of all can I take this opportunity to wish our past Club Captain Gordon Moffat and his family every success and happiness in their new lifestyle abroad. This change in Gordon’s circumstances has meant that as current vice captain I was offered the role of club Captain. I accepted and I am honoured and feel very privileged to carry out this role at such a fantastic golf club. We have a tremendous course, a refurbished clubhouse on its way, a great professional and his team and a very helpful steward-we also have a very enthusiastic, helpful ,competitive and friendly membership that is represented through our club officials and a very hard working and experienced committee .These attributes will go along way to making sure golf is played at Bradley Park for many years to come .So, enjoy your winter golf, please continue to support our social functions and encourage new members. We are not going anywhere soon so enjoy your golf and I am sure the course will continue to be one of the finest around. On Friday 14 October, the Ladies section celebrated their annual dinner and presentation evening. This was a well supported evening with around 40 ladies in attendance to support our Captain, Sheila Braithwaite and to welcome her Captains from other golf clubs. Below are photos of Lady Captain presenting our prize winners with their trophies. The overall Golfer of the Year is always a surprise and announced on the night by our Competition Secretary, Sandra Shillito. This year the winner was Linda Bemrose. Well done to her and all the other prize winners. 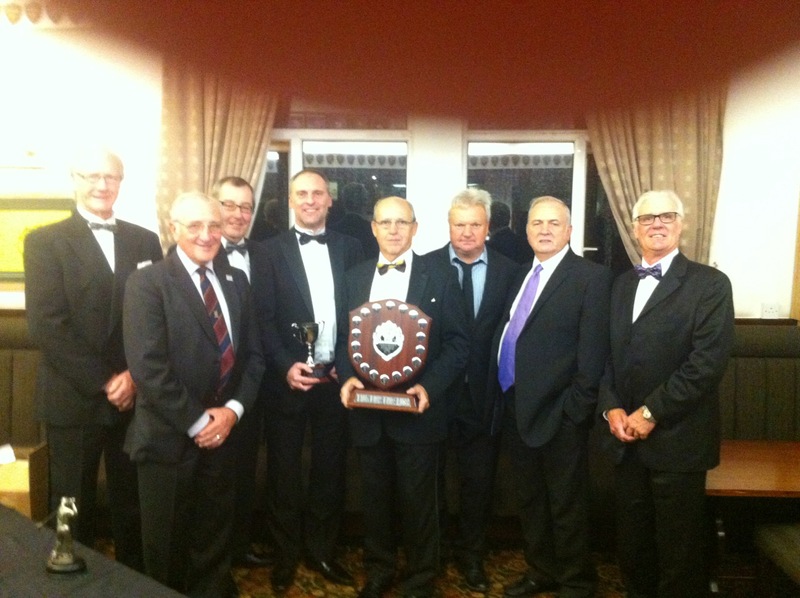 The Rabbit Captains of 2015 attended a golf event at Dewsbury Golf Club on the 6th October. Eleven past Rabbit Captains attended from Fixby, Woodsome Hall, Meltham, Crossland Heath, Longley Park, Outlane, Elland, Dewsbury, West End and Bradley Hall along with myself from Bradley Park. It was won by myself with 37 points and this will be an annual event so the winner holds the event the following year so in 2017 the competition will be at Bradley Park. The picture above shows me receiving the trophy from the past Rabbits Captain of Fixby Mich Dearman . An enjoyable day was had by all and £70 was donated to the charity for Parkinsons Disease. Over 50 individual prizes and trophies were presented at Bradley Park Golf Club on Saturday 17th September at the end of Rabbit Captain’s Day. Rabbit Captain, Trevor James, congratulated winners and complimented Kirklees Active Leisure and the Bradley Park greenkeeping team for having the course in excellent condition. Prize winners on the day included Phil Fullwood in Division 1 (0-15 handicap), Mike Glover in Division 2 (16-28 handicap) and Joan Birks who was the runaway winner in the Ladies section. Lady Captain, Sheila Braithwaite, presented prizes from the Lady Captain’s Day competition held on Sunday 11th September. The Ladies section was won by Lisa Driver, with prizes for Bob Balcom, Mark Ramsden, Karl Schnacke and Martin Shaw in the men’s competition. She also presented prizes to Gabriella Child and Damien Cockcroft for their successes in Junior competitions during the season. Trevor James then presented prizes for the competitions run by the Rabbits’ Section during the season. Major prizewinners included Peter Fuller – Singles Knockout Trophy, Roger Pearson and Paul Kinghorn – Pairs Knockout Shield, Mick Cox – Rabbits’ Trophy. The Buck Rabbit Trophy, awarded to the best high handicap golfer of the season, went to Tom McGarrell. The evening included excellent singing entertainment from Alicia Brady, hot beef sandwiches and a raffle.Charity donations made during the day came to over £150 and will be shared between Kirklees Hospice and Help For Heroes. Trevor James also presented Derek Broadbent, the Club President, with a watercolour picture of the clubhouse painted by long standing club member and local artist Tony Brady. Attached is the Greens report for September. Any queries, please contact Gary Ward. Any thoughts and feedback are always welcome. The club Presentation Evening has been postponed due to the refurbishment of the club house taking place. A new date will be arranged for the New Year. First I would like to thank all the members who put the time in to play in the league 2016:Clifford Froggett, Philip Smith,Trevor James (Rabbit Captain), Peter Higham, Roger Pearson, Donald Levitt, Robert Balcam ( Vice Rabbit Captain), Paul Kinghorn, David Singleton, John E Smith, Tom McGarrell (League Captain ). Bradley Park will be in section C playing against Hebden Bridge, Castlefields, Longley Park and Elland. I would like to see more Rabbits playing in these game instead of the same members every year. The majority of club members are Rabbits so when the club lists are published next year please support the club. All members, including guests are invited to this evening on Saturday 17th September starting at 8pm. It is a chance to attend a social event and support the two Captains, Trevor James and Sheila Braithwaite. There will be a presentation for both the Captain’s Days which are taking place on Sunday 11th September for Lady Captain and Saturday 17th September for Mr Rabbit Captain. Please support these two days. The evening will continue with entertainment provided by the superb Alicia Brady and hot beef sandwiches and chips. As always there will be a raffle which donations will be gratefully received. Both Captains look forward to welcoming and seeing many members and guests on what will prove to be an excellent evening. Juniors – In the Junior League we played Huddersfield at home on 1st July and lost 3 – 1. A great win for Rhys against some tough opposition. We played Woodsome away on 8th July and lost 3 – 1. Well done Joe on a great win against a single handicapper and thank you to Sandra and Amsal who stood in for me. We finished 3rd in the yellow division, one point behind Huddersfield – well done. Ladies – Yorkshire Ladies: In the ADP on the 25th June we played Forest of Galtres away and lost 2 and halved one. We have now completed all our matches and finished 25th out of 50 in the league. Ladies – Evening League: Against Outlane we lost 2.5 to 0.5 but the ladies enjoyed the evening. Bradley Park v Castlefields won 7 – 1, Bradley Park v Willow Valley lost 6 – 2, Bradley Park v West End won 7 – 1. Foursomes – Bradley Park v Meltham won 3 & 2 and progressed to the semi-final. Rabbits – 5th July Hebden Bridge away lost both games, 12th July Hebden Bridge at home won both games, Marsden home and away to come. With good results the Rabbits can remain in Division B. Seniors – 24th June at Dewsbury lost – 0 points, 15th July Oldham at home won 8 – 0, 22nd July Meltham at home drew 4 – 4. Attached is the Greens Report for July. Any queries, please speak to Gary Ward. Information about the care of bunkers and lists of members responsible these can be seen in the attached document. Ladies are to be added shortly. Scratch Team – Outlane (H) won 6 – 2, Hanging Heaton lost 2 -6. Handicap Team – Castlefields (A) lost 3 – 5, Outlane (H) won 8 – 0, Willow Valley (A) lost 2 – 6, West End (A) won 5 – 3. The team are 3rd in the league having played all the tough away games. The Handicap team was leading the Union event before the course closure took place. Completion update next month. In the Foursomes event, both teams went through round 1. In round 2 BP1 progressed to round 3 and BP2 were knocked out. Ladies – West End, won 2 – 1, Bradley Hall (A) lost 0 – 3 but the course was in excellent condition. Ladies ADP League – Forest of Galtres (H) halved. Currently the ladies are 9th in the league of 50 clubs. Juniors – Woodsome Hall (H) drew 2 – 2, Elland (A) won 3 – 1, Longley Park (H) won 4 – 0. The Juniors are top of the Yellow division. Rabbits – Fixby at home has to be replayed due to the weather, Fixby (A) lost both games. Next fixture is Hebden Bridge away. The Ladies invite all members, friends and family to a Fashion Show on Thursday 28th July at the Golf Club with money raised going to the Yorkshire Air Ambulance. Tickets are on sale at £5 each which includes a glass of wine. Please see the poster for more information on the evening and about where to purchase your tickets. Any queries please see Gary Ward. Also once again, can we ask that we are doing our bit to keep the course in the best possible condition by raking bunkers, replacing divots and repairing pitch marks. Played away at Rudding Park on the 9th April, won 2 – 1. Linda won 6&4, Pam won 4&3, and Sheila Harrison lost 3&2. Played Calverley at home on the 16th April, lost 2-1. It was a hard task for the Ladies as they all had to give away shots. Linda won 6&5 having to give 10 shots, Pam lost 3&2 and had to give 3 shot, Sheila Braithwaite lost 3&2 and had to give 8 shots. Played Rudding Park at home on the 30th April, we won 3 – 0. Linda won 8&7, Pam won 3&2 and Sandra won 6&4. Played Calverley away on the 21st May, we lost 3-0. Sarah lost 7&6, Pam lost 5&3 and Sheila Harrison lost 3&2. It was a tough match away from home. Played against Huddersfield Golf Club on 9th May. Unfortunately we lost 2 – 1. Played against Todmorden at home on 18th May, which we won 2 – 1. Played Elland at home on 4th May and won 4-0. Played Longley Park away on the 6th May and drew 2-2. Played Huddersfield away on 16th May and lost 3-1. It was a very tough match and Rhys after going 3 down came back with some brilliant golf to win 2 & 1. Joe took it to the 18th in his match and just lost out but they all played some great golf. We currently stand 2nd in the league just behind Woodsome. Played Willow Valley away and lost 7-1. Played Castlefields at home and lost 5-3. Played Crow Nest at home and lost 6-2. The next game was against Outlane at home where we obtained our first win of the season —Report to follow next month. Played Crow Nest at home and Graham Hollindrake won 2 & 1. A solid performance level through 10 holes before pulling away for comfortable victory. Barry Martin halved. He was 5 down at the turn before pulling back to level by 15, lost 16 but a great birdie on 18 to secure a half. Adam Mchlachan won 1 Up. He was 1 up by 16 and held off for a good win in his first game for the handicap team A.
Andy Bemrose lost 2 & 1. Return of the former captain. He did not have the greatest of luck, a 3 putt on 9 had him go from potentially level to 2 down. He kept plugging on but never recovered. Played Meltham Away Lost 2up and 4 and 2. Played Queensbury Away Lost 2up and 2 and 1. Played Saddleworth away 6th May obtained 4 points. Played Hanging Heaton 13th May obtained 3 points. Played Oldham 20th May obtained 3 points. Played Meltham away 27th May obtained 2 points. 128 – Julie Starkie, Carol Pygott, Debbie Fisher & Madeline Armitage from Kingwood. 2nd – 129 – Linda Bemrose & Lisa Driver from BPGC, Judy Vickerman & Andrea Wallis from Crosland Heath. 3rd – 132 – Annette Jowett & Annette Bird from BPGC, Jan Murray from Outline and Lizzie Nicholson from Woodsome Hall. Nearest the pin in 2 on the 11th – Lnda Bemrose BPGC. Nearest the pin on the 13th – Christine Robinson from Northcliffe. Attached is the Greens report for May. Any queries, please contact Gary Ward. Mr Captain’s Day and night is fast approaching, taking place on Saturday 4th June. Please sign up to play golf during the day, taking part in the military theme and in the evening bring along family and friends to support Mr Captain in his fun packed evening. For further details open the link below. Following the Ladies v Rabbits next Saturday, the Casino Night which is organised by the ladies will be taking place. The evening starts 8pm and tickets are now available from behind the bar at £5 each which includes your casino gambling chips. There are excellent prizes for the winners. During the evening there will be the Winter Greensomes and the Ladies v Rabbits presentation. Those in attendance will receive extra shots for the Texas Scarmble the day after. Please come along with friends and family to support the Ladies section and this event. We are also asking members to kindly donate prizes for the evening and these can be left in the office or given to committee members before 8th May. The committee look forward to seeing you all there. The photo above shows some of the sun drenched members who attended Mr Rabbit Captain’s Away Day held at Shipley Northcliffe Golf Club on Wednesday 20th April. Trevor James enjoyed his day as did the members in what was the warmest day of the year so far. There was a good turn out from the Tigers, Seniors and Rabbits with Mr Captain and Mr President both in attendance. There was a cause for celebration as Bob Balcam scored a hole in one on the par 3 4th hole with a stunning 6 iron. The winner was Phil Smith with 36 points. Trevor would like to thank all participants and may the sun continue to shine. Attached is the Greens report for March. Any queries please contact Gary Ward. After the huge success of the ‘Fawlty Towers’ nights in 2014, the Social Committee have organised an ‘Only Fools and Horses’ night to take place on Saturday 23rd April in the clubhouse. The cost of the evening is £29.95 which includes a 3 course meal hosted by Derek Trotter (Del Boy) and entertained by Rodney and Uncle Albert. This will be an hilarious evening brought to life by a critically-acclaimed cast of professional actors. Below is a poster with further details. To make sure you don’t miss out on a place, please sign up on the list in the clubhouse as soon as possible. We managed to play golf on Friday 11th March on a lovely, warm afternoon in fine weather for a change. We had a good turn out of 17 club members. The winners were: Dennis Fitzpatrick with 24 points, Graham Hollindrake 23 points, Peter Higham 20 points, Lee Pickup 20 points, Harry Belafonte 20 points. Friday 18th March will be the last meeting of the winter social for 2016. Subscriptions will be collected in the clubhouse on Saturday 2nd April between 12 noon and 2pm and on Sunday 3rd April between 2pm and 4pm and again at the same respective times on the following Saturday and Sunday, 9th and 10th April. It is hoped that these new collection times will assist members. Alternatively, you may post your subscription to Nick Howe at the Golf Club. Please enclose a large SAE for return of a new handbook and a signed copy of the invoice. Please DO NOT SEND CASH through the post or ask the professional staff, stewardess or bar staff to accept payment of your fee. If you do not intend renewing your membership please inform Nick Howe. Any member who has not paid by 6pm on May 1st 2016 may be deemed to have resigned. Attached is the Greens report for February. Any queries please contact Gary Ward. Bob Balcam and Graham Hollindrake with 22 points and Harry Belafonte with 21 points. There are only 4 more meetings this year: 4th, 11th, 18th and 25th March. The last time the social golf was played was 18th December, and today (Friday 5th February) we got out on the course. The weather was a bit cold and overcast but we braved the mud to have an enjoyable game. Alan Brown with 17 points. We are intending to run the social golf every Friday until the 18th March. The first tee off is a 12pm again depending on the weather. All those intending playing should contact the pro shop and check that the course is open. Players are requested to be at the club by 11.30am. The Club has submitted its RESPONSE TO THE CONSULTATION. This has been submitted to Kirklees and a copy of the full document is attached. We are proposing to send this to every Kirklees town councillor and to the Huddersfield Examiner and the Yorkshire Post, amongst others. We hope that members will feel that our consultation document is sufficiently robust. Barry Sheeman, MP, visited Bradley Park Golf Club on the morning of Saturday 30th January. At a meeting in the club house, Mr Sheerman was accompanied by Councillors Ken Smith and Amanda Pinnock, two of the councillors for Ashbrow ward in which the golf course is situated. Also present were a number of Bradley Road residents as well as Bradley Park members. Mr Sheerman had come at the invitation of local resident Mr Michael Schofield, who had contacted him expressing concern over the proposed development of Bradley Park golf course. Following an introduction by Club President, Mr Keith Waddington, Mr Sheerman and Councillor Ken Smith took part in a question & answer session, responding to questions and points raised by club members and residents present. Mr Sheerman declared himself to support the campaign to keep the land at Bradley Park for use as a golf course rather than for housing. He expressed concern over the possible loss of a valued and affordable sporting facility and stressed the importance of participation in sport. His view, in essence, was that, whilst he appreciated the need for more housing in the area particularly for the elderly and the younger generation, he considered Bradley Park to be an inappropriate place for housing. He encouraged the residents and Bradley Park members to continue the campaign to save the course in a constructive but firm manner, and also emphasised the importance of maintaining lines of communication throughout the campaign between the Club, the residents, the local councillors and other interested parties (including himself). Attached is the Greens report for January. Any queries, please contact Gary Ward. At the Golf Club AGM on the 21st January, the members present voted unanimously to adopt a new constitution for the Club. The new constitution was explained to the members present by the Club Secretary. A copy of the new constitution is now displayed in the main locker room. Any member who wishes to have a copy of the new constitution may contact the Secretary, Nick Howe who will be happy to supply a copy. 24/01/2016 – Fantastic achievement – Bradley Park hits the mark with National golf award! During the year, Lady Captain, Sandra Shillito and the ladies raised £280 for Sandra’s chosen charity. Here is Sandra presenting a cheque along with an extra £100 donated by the Rabbits section to a representative from Kirkwood Hospice. The Ladies section and the Club held two Christmas events in December. 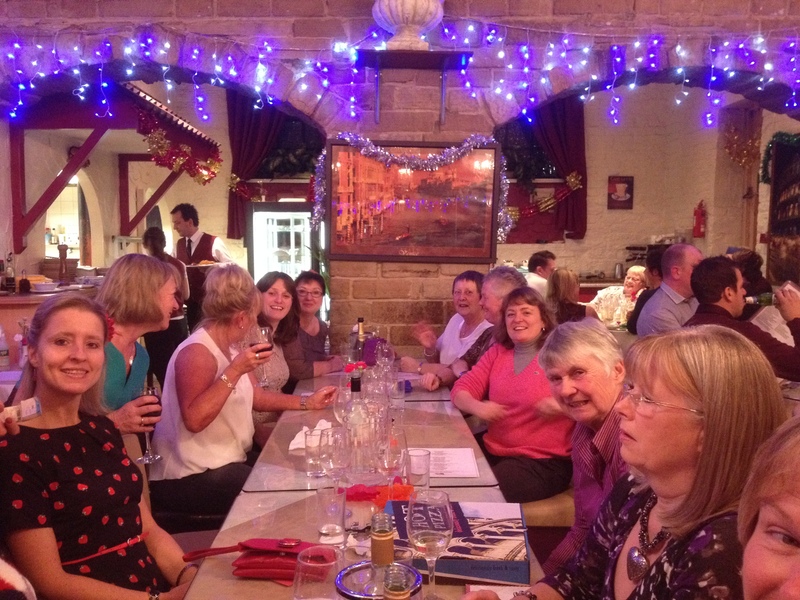 The first was the Ladies meal, held again at Bellinis in Brighouse organised by our Lady Captain Sandra Shillito. Eighteen ladies attended and an excellent night was had by everyone with all taking part in our Secret Santa. On Saturday 19th December a packed room of members, family and friends enjoyed a fun night of games organised and run by Richard Kaye and Derek Broadbent. The evening started with everyone singing and acting out, ‘The 12 Days of Christmas’ followed by an excellent Christmas meal. The evening progressed with games for children and the adults, a musical quiz and a raffle which at times became a little’competitive’ and heated. Here are some photos showing the fun everyone had. This competition on Sunday 13th December is open to all members of the club plus friends from other clubs. Money raised is for charity. Lets support this event and we can use the publicity to promote our great Club. The consultation period has been extended until February 1st 2016. We continue to urge people to log into the Kirklees portal and voice their objections in order to save Bradley Park. On this cold and frosty Saturday morning, members of the junior section, parents and committee members dropped around 1000 leaflets into properties and Bradley Road and the surrounding area. This has had a positive effect already with a number of residents signing onto the Kirklees portal expressing their concerns. These are not new proposals. The first Examiner article makes it appear as if this is a new “bombshell” which Kirklees Council has suddenly dropped. As Parnell Reilly is reported as saying in one of the newspaper articles, talk of possible development plans has in fact been around for several years. These so-called proposals have been mentioned from time to time in committee. It is thought that the matter is only now receiving the prominence which it is because the newspaper has latched onto the recent re-issue of the Council’s Local Plan identifying those areas where housing development could, not will, be carried out. These are not definite proposals. The Council has identified a great number of different and varying sites across Kirklees where land might be released for housing. That is all that has occurred so far – nothing more. The new plan actually identifies over 200 separate sites. It is true that the land occupied by the golf course is included in that provisional list of 200 possible sites, but a closer look at things reveals many factors which may mean (as Parnell clearly believes) that development proposals at Bradley Park will come to nothing. Apart from it being green belt, there are many factors militating against housing development on this site, including its location partially on a former tip, the electricity pylons, the Kirklees Way, the proximity of the M62, the implausibility of affordable housing in this area and its established use as a popular golf/footgolf complex. These are not imminent proposals. Despite the impression given by the Examiner, even if Bradley Park is ultimately included in the housing proposals, this is a long way down the track. As we understand it, there will be consultations following which proposals will be submitted to central Government some time in 2017. There is plenty of time to mount a case in support of keeping the course open. There is much we can do. KAL has already come out strongly in favour of keeping the course open and we are confident that, should it become necessary, Bradley Park would receive massive support not only from the local golfing community (including the District & County Unions) but also from the general public – and probably from the Examiner itself. In short, housing development on Bradley Park golf course is neither a certainty, nor even a probability, but it may perhaps become a possibility at some future time. The Club committee therefore does not wish to over-react to the present furore, but it does wish to reassure all its members that it is keeping a close eye on developments, intends to be involved along with KAL in the consultation process and will be fighting to ensure the future of affordable and enjoyable golf at Bradley Park. In the meantime, your Committee intends to continue in its present efforts not only to update the Club’s profile but also to grow the Club both in terms of numbers and quality of golfing and social events. Twenty club members took part in the Social golf today on a nice afternoon with some high scores posted for 10 holes. In first place was Ben Page with 24 points and in joint second place were Chris Fawcett and Graham Hollingdrake with 23 points. This is turning out to be a popular Friday afternoon outing where club members are meeting with members they do not normally see on the course. Nearset the pin on the 17th – Sid Ruttle – Outlane GC. Below is the Green’s report. Please contact Gary Ward if you have any queries. The Rabbit’s Section had it’s first meeting of the Winter Social Golf with 12 club members taking part. The winner was Mick O’Hara with 22 points, second was Dennis Fitzpatrick with 20 points and joint third with 19 points, Barry Workman and Nick Howe. A very good afternoon was had by all. The next game will be held on the 16th October and is open to all Bradley Park Golf Club members. Meet at 11am for coffee and bacon sandwiches (at own expense). The entrance fee is £3 and the first tee off is 12pm from yellow markers for gents and red markers for ladies. It is an individual stableford playing off a full handicap. Games will be played in either a 4 ball, 3 ball or 2 ball and may be mixed depending on numbers attending. The fee collected will be split between 1st, 2nd and 3rd places. We look forward to seeing members. The next 3 players through to the Grand Finale are: Ben Kaye, Jordan Taylor, Rhys Haywood. The draw for the Medal Winners, Grand Finale and October medal will take place on Friday 25th September at 12:00. Any members names not on the entry sheet will not be in the draw where there will be no preferences given for times. The 2s from the Membership Medal competition paid £20 each to: P. Kaye, C. Froggett, J. Harrop. The Bogey competition can be played as a 4 ball and a poster will be displayed with the rules. HHDUGC have run a series of Junior Open Competitions with an additional incentive of eight clubs working together offering both Congu and Club handicap juniors the opportunity to participate. Michael Edwards (pictured) is Bradley Park’s non-congu winner at the recent event run at West End Golf Club. The additional competition has been very successful as all clubs have had an increase in attendees. Congratulations to the winners of the Steve Brook trophy – D. Harrison, R. Pearson and K. Harrop with 73 points. After sterling work as our Competition Secretary, Michael Waddington has indicated his wish to stand down from the post at the end of the current club year, March 2016. Accordingly, the club is looking for a member of at least 12 months’ standing to take over from Michael as Competition secretary from April 2016 onwards. This is normally a 3 year post. Michael has confirmed that he will prepare the competition calendar for 2016/2017 and also be available to assist his successor in all aspects of the job throughout that year’s golfing season. The post comes with the benefit of an annual honorarium. Nicholas C.W Howe, Secretary Bradley Park Golf Club, 49, Mountjoy Road, Edgerton, Huddersfield, HD1 5QG or email to : ncwhowe@outlook.com. Interested members are requested to submit applications by 20th September. The members below have qualified for the Medal Winners Cup on Sunday 4th October. This will be a totally drawn competition. If any member is unable to play throughout the morning of the 4th please do not put your name down. Anyone cancelling will be subject to club procedures. T Riley, P Fuller, B Martin, A Mansaf, T McGarrell, M Shelton, T Kelly, P Kaye, D Fitzpatrick, K Schnacke, A Edinborough, L Pilkington, M Cox, M Hanson, J Wyatt, H Belafonte, A Stringer, M Ramsden, S Turner, E Livingstone, J Harrop, D Dobson, P Walton, S Barraclough, M O’Hara, C Fawcett, A McCullagh, G Hunt, P Smith, A McLachan, J Taylor, P Stringer, L Pickup, P Kinghorn, J Gryckiewicz. L.Pickup, M Hanson, A Edinborough, K Hutchinson, A McLachlan, JP Cousins, R Haywood, E Riley, L Pilkington, B Martin, B Haywood, M Cox. The same procedures as above apply. Over 160 players from 20 Golf clubs across Yorkshire and Lancashire attended this years successful 4AM event. There was great support from South Leeds (24 players) and Heaton Park (16 players). Prizes were shared between visiting golf clubs and Bradley Park. Feedback from attendees was very positive. Saturday 19th September is an exciting day for Phil Smith (Rabbit Captain) and Sandra Shillito (Lady Captain) as it is the Rabbit Captain’s competition during the day followed by a joint evening presentation and social for both captains. It is a chance for all members to play during the day for a variety of prizes and then come along at 7.30pm with family and friends to support the Captains. 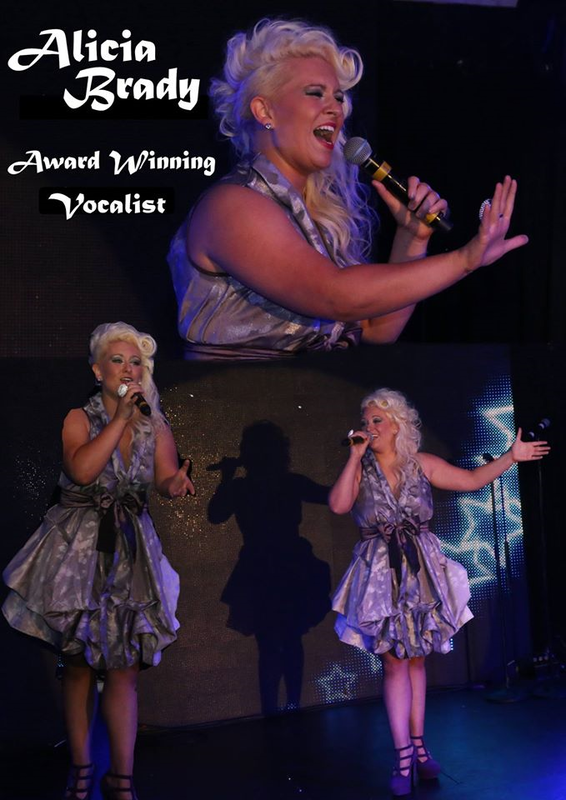 During the evening you will be entertained by a superb, female award winning vocalist, Alicia Brady. See the attached poster for more details about the day and night. Lady Captain’s day this year is on Sunday 13th September. We hope to see as many members as possible playing, both men and ladies supporting Sandra Shillito. There will be bacon butties, cakes and a little tipple at the hut with proceeds going to Kirkwood Hospice. The presentation of prizes will take place the following Saturday, 19th September. See below for the August Greens report. Any queries, please contact Gary Ward. Bradley Hall 30 pts promoted to section A, Woodsome Hall 28 pts promoted to section A, Bradley Park 24 pts remain in section B, Meltham 23 pts remain in section B, Castlefields 23 pts relegated to section C, Halifax Ogden 22 pts relegated to section C.
The clubs in section B for 2016 are : Huddersfield, Queensbury, Bradley Park, Meltham, Marsden, Hebden Bridge. Many thanks to all club members who played in the league competition. Next year we will gain promotion into the top section. Bradley Park v Bradley Hall – won 3/2 and 5/4 gaining 5 points. Bradley Hall v Bradley Park – lost 5/4 and a draw gaining 1 point. Paul Kinghorn, Phil Smith (Rabbit Captain), Roger Pearson, Trevor James (Rabbit Vice Captain), Colin Robinson, Donald Levitt, Bob Balcam, Nick Howe, Keith Waddington (President), Tony Brady, Cliff Froggett, Tom McGarrell. The final league position will not be known until all the other clubs have submitted their results at the end of August. There will be a Medal competition for the men on Sunday 23rd August. Bradley Park v Castlefields at home – 4/3 win and a draw gaining 4 points. Castlefields v Bradley Park away – lost 4/2 and 3/2 with no points. Our last 2 games against Bradley Hall GC are on the 4th and 11th August. Please see the attached for the Green’s report. Any queries please contact Gary Ward. I held my Away Day at Woolley Park Golf Club on the 17th June. We didn’t have glorious sunshine but it was mainly warm and dry. Seventeen ladies including myself came and we enjoyed the course which was in lovely condition. Bacon butties was followed by the golf and then a two course meal. Woolley Park were excellent hosts and couldn’t do enough for us. The winner was Nancy Willingham, followed by Sue Malins and Pam Flaherty. Additional prizes went to Sheila Braithwaite and Lisa Driver. A big thank you for the bouquet of flowers and for all coming and sharing this special day with me. I hope you all enjoyed your small bag of goodies. For the months of July, August and September 2015 there is an Introductory Membership offer for Juniors. Please see the attached poster for details. Yorkshire Ladies ADP: Home V Thirsk and Northallerton won 2.5 – 0.5. With one match to play Bradley Park ladies are top of the table. Ladies Evening League: Away V Crow Nest lost 4 – 0. Junior League: Home V Bradley Hall 4 – 4 draw, Home V West End 6 – 2 win, Home V Dewsbury 8 – 0 win. Handicap team: Away V Castlefield lost 6 – 2, Home V Outlane drew 4 – 4, Away V Bradley Hall lost 7 – 1, Home V Willow Valley, lost 6 – 2. Scratch team: Home V Elland won 8 – 0. On the 21st June the team came 8th in the championship meaning they stay up for next season. Rabbits league: The second match away V Ogden lost 6/5 and 3/2 gaining 0 points and home V Ogden won with 1 up and lost 3/2 gaining 2 points. In the third match against Meltham won at home 3/1 and 4/2 gaining 5 points and won at home with 1 up and ;lost 8/7 gaining 2 points. This fantastic full day event takes place on Saturday 11th July with the individual stableford and various competitions being organised for the day followed by an evening of entertainment with a band, the brilliant Vital Signs, food and a raffle. Loud shirts are encouraged in the evening. If members could kindly donate raffle prizes this would be appreciated. We hope to see a club house packed with members at night for what is always an excellent evening. Please see the poster in the clubhouse for more details. There is a final call for members to complete and return their membership survey form which they would have received with the AGM/renewal notifications. These forms and the views expressed in them do provide the club with very useful information and it would really be appreciated if those who have not completed a survey form would take a few minutes to do so. We held our Annual Ladies Open Day on the 3rd June and were delighted to have 31 teams taking part. The weather was dry if a little cold but didn’t spoil a wonderful day. Thanks go to everyone who helped on the day. The Winners were Anne Martin and Mary Workman from Bradley Park with Pat Hand and S Rawlinson from Ryburn with a score of 136. In second play were Annette Jowett from Bradley Park with three ladies from other clubs, M Hawkyard, G Fielding and J Murrey with a score of 137. In third place were a team from Crow Nest, C Hampson, V Whitehill, M Widdup and J Langfield with a score, after a countback of 138. Nearest the pins were won by H Jacques from Cleckheaton and E Henderson from Queensbury. 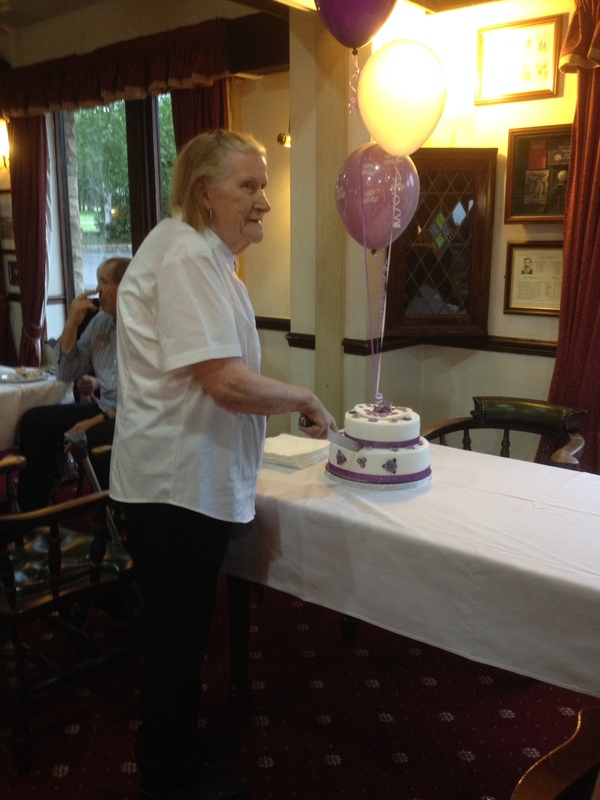 One of our ex Lady Members was 90 at the end of April and her family held a party for her at the Golf Club. Her family asked for any members to attend and the following members were present – Mr Captain, Andy Bemrose, Lady Captain, Sandra Shillito, Donald and Sheila Harrison, Jennifer Childs, Dot Haigh and Pat Bricklebank. We collected from the members and were able to give her a Post Office Voucher for £50 along with a plant and a card. It was a very enjoyable evening and she was very surprised by the number of people who came. Would those club members who have not yet done so, please complete and return the membership survey form which they would have received with the AGM/renewal notifications. These forms and the views expressed in them do provide the club with very useful information and it would really be appreciated if those who have not completed a survey form would take a few minutes to do so. Also, don’t forget that there is a prize draw for all forms returned. If you have misplaced your form and would like a spare copy, please ask the club secretary Nick Howe. Thank you to all those members who have already returned their forms. Below is the draw for next Saturday, Mr Captain’s Day. A reminder that there is a rugby theme for the day and a full night of entertainment will follow. Please support Andy Bemrose on his day. G. Ward, K. Hutchinson, L. Bemrose with 58.16 and M. Hanson, C Ruttle, M. O’Hara with 60.16. Congratulations to the Ladies. The ladies were outright winners as a keenly fought contest was followed by an enjoyable after match tea and scones and a drop of alcohol. Plenty of banter took place regards the contest and all players were thanked for their efforts from Phil and Sandra. The result was 4.5 to 1.5. The presentation followed in the evening at the Casino Night. Attached is the Greens report for May. Any queries please contact Gary Ward. Home match V Woodsome Hall GC on May 5th – Trevor James and Phil Smith won 7&6, Tom McGarrell and Donald Levitt lost 4&3. Away match V Woodsome Hall GC on 12th May – Roger Pearson and Nick Howe won 2&1, Cliff Froggett and Keith Waddington lost 4&2. Bradley Park have 5 points with 6 holes up, one more than Woodsome Hall. Well done to all players. Congratulation to Kevin Hutchinson, the winner of the Silver Jubilee Cup with a net 64 on a count-back. The Division 1 winner was Steve Turner – net 64, Division 2 was Cliff Froggett with 68 and Division 3 was Mick Cox with 76. The club is hosting a Rules Evening in the clubhouse on Friday 22nd May at 7pm. The evening is entirely free and takes the form of an interactive demonstration (not a lecture or a seminar) by 2 rules “experts” from the Yorkshire Union. The demonstration is designed to highlight real situations which can arise during a round of golf. It is hoped that the event will appeal not only to those who are relatively new to golf but also to “old hands” who think they know the rules but still find themselves having to consult their rule books from time to time. The presentation is likely to last about 1.5 to 2 hours and the presenters will be happy to take any questions on any points on the rules of golf that may arise. We think this will be a user-friendly, enlightening and helpful evening and all are welcome. Congratulations to Adam Edinborough on winning with 39 points. His handicap has been reduced slightly. The feedback from all the attendees said that the Bradley Park Away Day was a huge success! The day took place at Worksop Golf Club and 40 club mŷembers in attendance. The weather was dry and sunny and the course was great. The greens were quick and tricky and the approach shots to the greens were the key to success. There was 4 nearest the pin winners – Mick Hanson, Gary Ward, Cliff Froggett and Phil Smith. Third place went to JC Woods with 33 points, 2nd place to Mick Hanson with 33 points and winner of the Tony Brady trophy was Andy Stringer who returned 34 points. The picture shows Andy and fellow members of Bradley Park overlooking the 18th green. Bradley Park Golf Club Ladies Section hosted the get together of the District Madam Captains and Vice Captains of 2015 on Wednesday 15th April. All nine Lady Captains were in attendance with eight Vice Captains. This dinner is an excellent way of the Vice Captains meeting for the first time and arranging other outings throughout the year before they become Lady Captains. One of the Lady Captains said how much she had enjoyed the evening and how it had made her think how we have all moved on from the same event last year when we didn’t know each other and how we are now all friends and comfortable with each other. After our two course meal Sue very kindly presented me with a birthday cake which was the following day. The sunshine on the east coast was waiting for nine ladies who went on the Bridlington Golf Trip staying at Carnaby in the Manor Court Hotel as we have done for a long number of years. The first day saw us play at Hornsea Golf Club with the winner being Linda Bemrose, followed by Filey Golf Club on the Thursday. The winner that day was Sandra Shillito. On the final day we played at Bridlington Belvedere with Nancy Willingham lifting the prize that day. Good golf, good weather, good food and the odd glass of wine was enjoyed by all. A big thank you goes to Annette Jowett for organising it all. The hotel is already booked for next year! Cliff Froggett and Michael Phillips played against Filey GC away and Tom McGarrell and Rob Balcom played against Elland GC at home winning through to the first round. In the Mellor Trophy, Tom McGarrell and Michael Phillips played against Crosland Heath GC at home and Phil Smith and Trevor James against Castlefields GC away winning through to the 1st round. On Saturday April 4th, the ladies played their first Yorkshire ADP League match at Bracken Ghyll. Well done to Sandra Shillito, Sue Malins and Linda Bemrose who took part and came away with 1.5 points for a win, a draw and a loss respectively. A great comeback from Sue after being 4 down at the turn. On Sunday 19th April we played away at Scarcroft and came away with 2 points. Well done to Linda Bemrose, Sheila Harrison and Pam Flaherty for 2 wins and a very narrow loss for Pam on the 18th. This was a great effort as Pam played a young, low handicapper, Linda had to give 14 shots and Sheila as usual put in a good winning round. The next game is on Saturday 25th April at home to Scarcroft. The committee kindly requests that the survey forms be returned as soon as possible as the information is required for the Golf Mark application. Congratulations go to P. Stringer and B. Smith, the winners of the 4BBB which took place on Sunday 19th April. 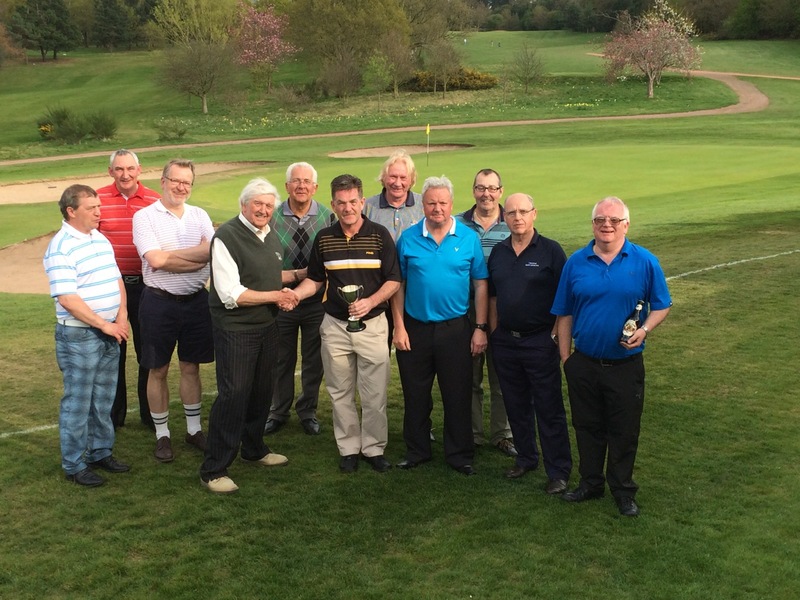 They won with 38 points on a countback from A. Stringer and P. Smith. For information about the day and the draw please click on the link below. If any member is interested in playing in this Rabbit’s event, please contact Cliff Froggett. WINTER RULES ARE NOW OFF. Fourteen teams entered the Pro Captain’s Challenge on Sunday 12th April with the Captain’s team of Mr Captain – Andy Bemrose, Lady Captain – Sandra Shillito, Club Pro – Tom Wild and Graham Hollingdrake scoring 79 points. This total was beaten by 2 teams only. Well done! The winners were a ladies team consisting of : N. Willingham, C. Wiltshire, L. Hallas and S. Braithwaite. Congratulations to these! Winners of the 2’s were: L. Hallas, G. Hollingdrake, S. Shillito, T. James. 4th – M. Riley & A McLachlan 38 points on a countback. Please see the link below for the March Greens report. Any queries, please contact Gary Ward. All members should now have received by now their notification of the Club’s AGM to be held in the club house at 8pm preceded at 7.30pm by the Rabbits’ Section AGM. We really hope to have a good turn out to the AGM this year. With the transfer of course management to Kirklees Active Leisure (KAL) last year and the Club’s recent application for the new upgraded GolfMark accreditation, these are interesting times for our Club. If you would like to find out more about these issues, please do come along to the AGM. We have a hard-working committee dedicated to promoting the interests of the Club and it’s members. If you feel you would like to contribute more directly to that aim, perhaps you might also consider standing for election yourself to the General Committee. There is a notice in the main locker room about this. Fresh ideas are welcome! We hope to see as many members as possible at the AGM. Our Club Secretary has, this week, spoken with KAL regarding various points to do with season ticket renewals and the outcomes can be read of the attachment below. The leaders are still J. Flaherty and P. Folan. Can anyone beat their total? The Greens report for January has been released. Any queries contact Gary Ward. Congratulations to Messrs Clegg, Hutchinson, Taylor and Schnacke on winning the Texas Scramble. Details are attached. We raised £320 which will go to the Forget Me Not Children’s Charity. Thank you and may I wish you all the best for Christmas & the New Year. The ladies section enjoyed their festive night out at Bellini’s Italian restaurant in Brighouse kindly organised by Lady Captain, Linda Bemrose. Everyone had a good night taking part in a secret santa and welcoming a new member Carlyn Wiltshire. Having played all their games, the current leaders with 246 points are J. Flaherty and P.Folan. Just a reminder that the 14th December will a Winter League free zone as it is the Christmas Texas Scramble. We raised £305 last year and hopefully we can beat this total this year. Please organise your teams and tee times. The Greens Report for November has been released by Gary Ward. Any queries or questions please contact Gary at gary.ward70@ntlworld.com. Some games have now been played with the early leaders being R. Suddick and G. Hunt. To view the latest results, click on the attachment below. Steve Barraclough, our Treasurer, who sorted out all those lovely vouchers for the winners. Roger Pearson and Tom McGarrell for sorting out the prize table. The Captain and President for their opening speeches and passing out of the trophies. Madame Lady Captain for presenting the Ladies & Mixed Prizes and providing a little merriment on the way. However, the biggest thanks goes to my co-host Sandra Shillito, not only for helping me with the prize presentation, but for also putting up with my constant changes as people pulled out at the last minute (next year a few days notice would be good as we have to keep altering the scripts). Finally, a big thank you to the members that did turn up and receive their awards and to the lads and lasses who gave speeches to congratulate both themselves and their opponents. The Club house was packed and the buzz of anticipation was great. There was just one problem- what time did we start? I was of the opinion it was 7.30, but no, the handbook clearly stated 8.00- so we all waited patiently for the last few to arrive. The introduction by the President was shorter than normal (someone must have had a word) and the celebrations began. The big winners on the night were Gary Ward, Roy Suddick, Paul Kaye, Mick Cox, Adam McLachlan and Amsal Mansaf. Congratulations to all of you, but also a big well done to our new Club Champion Mick O’Hara, who was a very deserved winner on the day. It will be interesting to see if he can defend that title next summer. The Greens Report for October has been released by Gary Ward. Any queries or questions please contact Gary at gary.ward70@ntlworld.com. The Winter League starts tomorrow. There are preferred lies throughout the course. Can players please sign in the book in the Pro Shop and after the round clearly place the number of the opposition on the card. 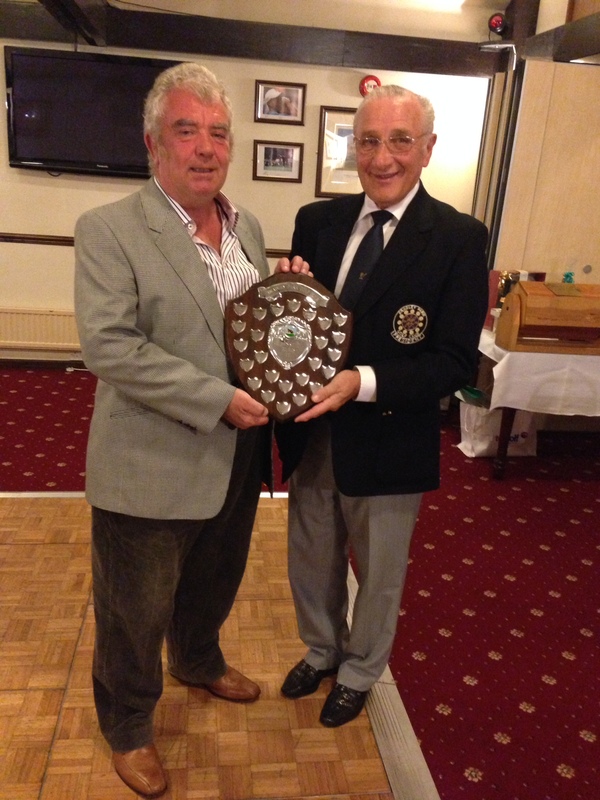 On Sunday 19th October the annual Rabbit’s Committee Shield was this year held at Bradley Park GC. Well done to Bradley Park who won by 3 games to 1. The return match will be played at Bradley Hall GC in October 2015. The game was played with fairly good weather apart from the strong wind and the leaves flying across the greens when trying to putt but the rain stayed away with only a couple of light showers. A very good day was had by all. Please see below for a list of prize winners and information on procedures for the evening. On Friday 17th October, the Bradley Park Golf Club Rabbit’s League team attended the annual dinner and prize presentation at Longley Park GC. Attending the dinner were Keith Waddington (Club President), Steve Barraclough (Rabbit Captain), Philip Smith (Vice Rabbit Captain), Tom McGarrell (League Captain), Roger Pearson, Donald Harrison, Paul Kinghorn and Trevor James. The presentation of the Section C Champions Trophy and Shield was made by the President of HHDRGA Mr Steven Shaw to the Rabbit Captain Steve Barraclough. The evening was enjoyable with good company, good food and entertainment provided by Mr Ken McCoy. Let’s carry on the excellent play in 2015 and move up the sections again. 06/10/2014 – Medal Winners and October Medal draw. Please see the draw below for this coming Sunday. The Competition and Handicap committee are looking to review the calendar of competitions for next season and are asking for your suggestions. Further information can be found in the attachment below. A thoroughly enjoyable day was had by members and visitors alike at the recent Seniors Open where BPGC members in particular but together some fantastic performances. Results as follows. The rabbits league team are the Divison C champion’s 2014!!! For the second year running promotion has been gained and we will be promoted to Divison B for 2015. As Rabbit league team Captain I wish to congratulate the following on a job well done: Keith Waddington, Paul Kinghorn, Rodger Pearson, Philip Smith, Donald Levitt, Colin Robinson, Trevor James, Harry Belafonte. It is intended to start the hollow tining of the greens on either W/C 22nd September OR W/C 29th September. This is obviously weather dependant and I will confirm the date as soon as I know. This is necessary work to maintain and improve what have been excellent greens this season and the earlier it takes place the better in the long run for the condition over winter and into spring. It is hoped that by selecting these dates it will maximise the effect on the greens and minimise the impact on competition golf, although some disruption is inevitable. Those fortunate enough to be playing knockout finals may wish to bear these dates in mind.